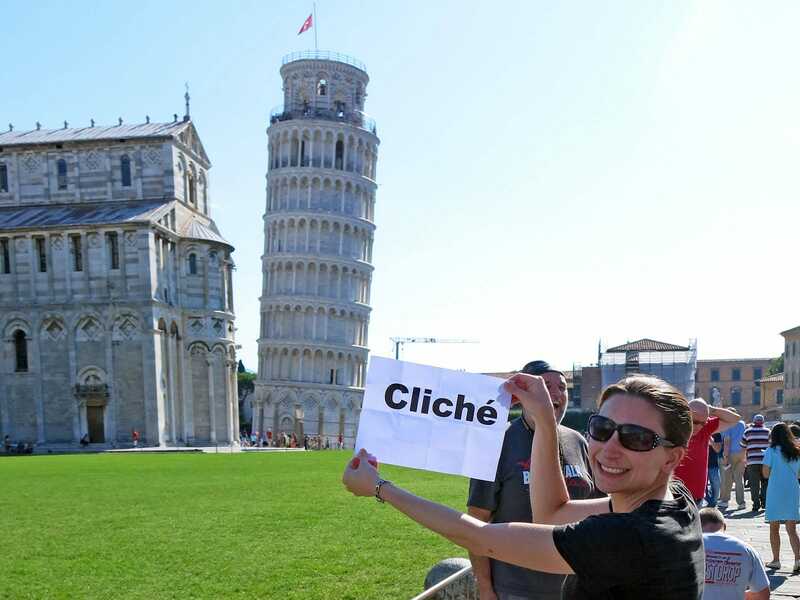 Day seven of the European Coaster Club trip to Italy began with a planned sightseeing stop at the Leaning Tower of Pisa. The vast majority of major sites around the world are crammed with vendors attempting to offload overpriced tat, and this one was no exception, with market stalls selling everything from poor quality food to ridiculous novelties. The captive audience was clearly reflected in the official prices too; a ticket for the tower was €18, not including the nearby Cathedral and Baptistery, and bus parking for the day was the bargain price of €235.60. Given the obvious gouging it wasn't much of a surprise to see roughly half of our group eschewing the climb in favour of finding somewhere shaded to rest, ideally with beer. We chose to leave these philistines to their own devices and concentrated on being proper tourists, though Megan insisted on her own variant of the usual photograph. 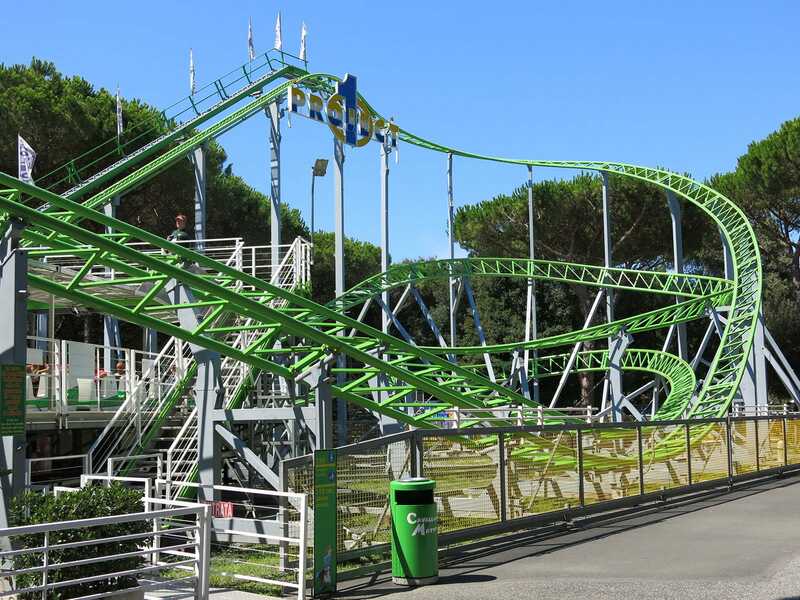 The plan was to follow the obligatory culture with a short stop at Luna Park di Tirrenia (Mattera), but the credit there was aborted after some last minute checking of the itinerary couldn't determine conclusively whether the park would be open or not. The thirty minute detour was short enough that I'd have chosen to drive past it anyway, but I was outvoted, and thus the bus headed directly to Cavallino Matto. Cavallino Matto was until recently a park targeted primarily at young families. My trip report from six years ago described it as pleasant, though not a place requiring more than an hour or two for the average enthusiast. That changed this year when management made the surprise decision to purchase a thirty-year-old stand up coaster from Canada that probably should have been sent to the scrapyard, as happened recently with an almost identical ride from the United States. As the "new" attraction was not yet open we decided to begin our visit with Topo Zorro, a family coaster in the footprint of a Wacky Worm albeit with a descending helix rather than a drop. The layout is to the best of my knowledge unique, and the manufacturer is anyone's guess; the only thing that seems to be known for certain is that the ride began life at the defunct Greenland park in Limbiate that has been abandoned for more than a decade, its full size coaster buried under a forest of weeds. 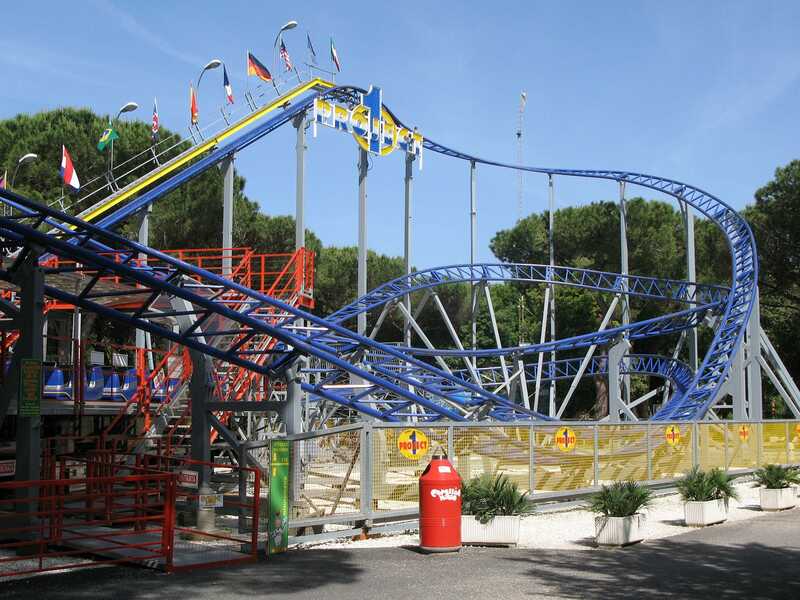 For the last few years Project 1 has spent the winter months at Luna Park di Genova, but remains impressively smooth despite the regular moves. The lack of roughness is probably due at least in part to the layout having no airtime or indeed any other forces to speak of, but only an enthusiast would care about something like that. The only difference from years ago was the colour of the track, which was repainted bright green at the end of the 2010 season. My old trip report described Wild Mine as having been built before its manufacturer mastered the art of track bending. Research has revealed that it was in fact the first coaster to be designed and built by L&T Systems, and thus it is not that surprising that it lacks the finesse of their later creations. Megan called the experience awful, a succinct description that for further accuracy should be read with an expletive modifier; every corner involved two vicious slams as the front and back wheel bogies hit their turn limits independently, and every drop felt like falling from a height onto concrete. Neither of us were sorry when it came to an end. We were able to recover our momentum somewhat at Speedy Gonzales, a clone of Mirabilandia's Leprotto Express, albeit without fiberglass vegetables for theming. The ride was running somewhat faster than its twin, albeit not quickly enough to be memorable as anything other than a tick. We did however enjoy a certain amount of schadenfreude at a young line jumper who face-planted in spectacular fashion while attempting to barge past us for the front seat. I've written many times before about how landscaping and paint on terrible coasters can be described as polish on a turd, but all the examples I've used for this in the past pale in comparison to what has been done with Freestyle. The antique Togo stand-up coaster has been unceremoniously dragged into the present day with a spectacular yellow paint job that is a world away from the advanced rust and peeling paint that one generally associates with a ride of this type, and the result really looks the part. It's just a shame that the ride experience isn't better. Ten years ago things were not too bad, but today it felt like the train had been fitted with oval-shaped wheels rather than the more traditional circular kind, and the bouncy ride coupled with my ongoing rib issues meant that once was ample for me. Most of our group felt the same way, though there were a few who felt differently, including my girlfriend, who has since written a thoroughly demented article extolling the virtues of the ride for the European Coaster Club magazine. There is one feature of the ride that summarises the entire experience for me; about two thirds of the way around the course, at about 1:10 in the POV, the track tilts to the left for no obvious reason. One could sort of understand if this were to avoid an obstacle, but there wasn't one in Canada and there isn't one here. 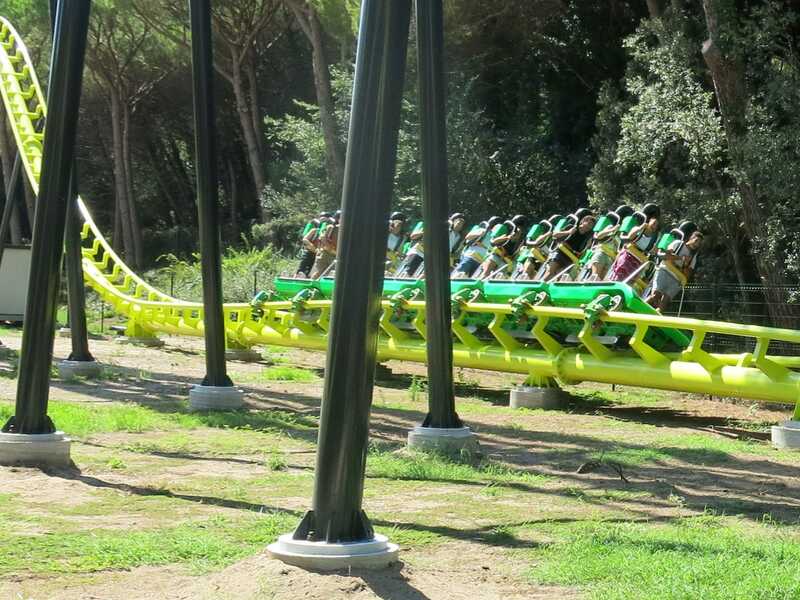 A small airtime hill (or even a re-profile of the existing one) would have worked far better, though on the plus side, the track still isn't quite as bizarre as the perfectly straight and level piece at Selva Magica. With all the coasters complete we went for a walk around the park in search of a decent meal, albeit unsuccessfully. The park has a sizeable restaurant and bar with an English menu located just outside the entrance gate, but it is only open during normal meal times. At other times of the day guests are left with a stall serving French Fries and the world's slowest sandwich bar, serving one person every five minutes or so. By the time we were through with that there was just enough time for one more ride, and we selected Safari Adventures, a track based car ride past a number of static animals, including elephants, monkeys, giraffes, lions, and hippopotami – and for avoidance of doubt, I'm not using the latter term as a synonym for coaster enthusiasts.